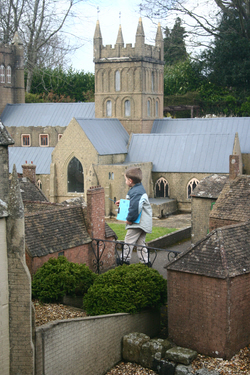 The “World Famous Wimborne Model Town” is a simple idea superbly delivered. It has delighted young and old for over half a century and could easily continue to enthral them for generations to come. The simple idea was to preserve a real town, or the best parts of it, as one-tenth models that can be walked around in the same way that a giant would walk around the real thing. Kids love it! The superb delivery comes in the attention to detail of the models, their layout and the way they are delivered to visitors. On entry to this open-air exhibition the first impression may tend towards disappointment. Especially if you are an adult returning to a much enjoyed childhood treat, you may think the whole thing a little small, but that is partly the nature of returning as an adult to things you first saw as a child, but also because you are presented with a sea of grey and brown rooftops, at least a hundred of them! Any disappointment is rapidly swept away by the sheer brilliance and enjoyment of what’s to come. At the gate, you’ll be given a quiz sheet appropriate for your age. Now the hunt is on. You must find all the things on your checklist. Your Gulliver’s Travels voyage has begun. You will find rapidly that the model town you initially may have thought disappointingly small is huge and fascinating. In many respects, it is more interesting than many full-sized modern towns of today. For a start, it is at street level that the town really comes alive. There are over 300 shop fronts and each of their windows is dressed to perfection with signs and goods of the day, which is somewhere in the nineteen-forties or fifties. There are fruit shops and clothes shops, book shops and bike shops, garages and pharmacists, pubs, hotels and teas shops. Every one is different and, with the exception of Boots the Chemists and the major banks, not one of the shops has the name of a national chain, which, in a Britain where the identity of every High Street is increasingly the same, is both thought-provoking and lots of fun! You’ll be asked to find all sorts of goods and street names and places. Kids will be flying in all directions and before you know it you’ll be wrapped up in the hunt for tennis racquets or bird boxes and enjoying a trip down this street or that and finding that, the town you thought of as a model, is in fact, every bit as big and interesting as the real thing and just as easy to get lost in! The longer you stay the more impressed you and your children will become by the attention to detail and the quirky nuances used to bring the town to “life”. Listen out for the flushing of the Public Toilets (there are at least two sets in town) or wait by the phone box and see if it rings (yes, it's the old type where you had to “Press Button A”). 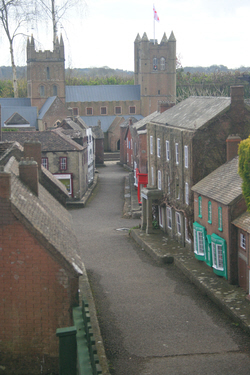 The centre piece of the town is Wimborne Minster itself. It strikes the quarter-hour just like the real thing and inside there’s a service taking place. But this exhibition is so much more than just the Minster. The same attention to detail and to real life has been replicated in every single home, shop, street and garden. Even the bushes and trees have been planted and pruned to give the effect of being part of a full-sized landscape. Perhaps the most amazing thing about the Model Town at Wimborne is that it is a community project in every sense. It is a model of a community built and maintained to the high standard it sets by volunteers. It is run by a charitable trust which raises funds for children’s charities. You could easily spend half a day here or more without getting bored or going hungry. Within the confines of the garden setting of the model town, there is also a small putting green, a café, a small play area and a model train exhibition (buttons to push and trains to move). The model town itself, was almost lost. If fell into disrepair in the 1980s when the land on which it sat was scheduled for development. Thankfully it was moved, piece by piece, to its current premises, which allowed it to grow. Once you’ve seen the models, you’ll want to see the real thing. 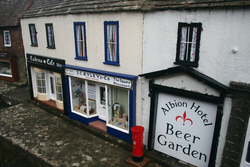 Bits of the town you’ll recognise from the miniature, some shops, pubs and hotels for instance. The real Minster is impressive too and contains the tomb of the parents of Henry VII’s mother, which could be of interest if your kids are studying the Tudors! As will some of the other buildings in the town. 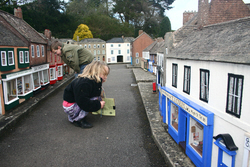 In short, whether for the model or the real thing, the town of Wimborne Minster is well-worth a visit! 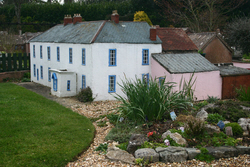 The “World Famous Wimborne Model Town” is a simple idea superbly delivered. It has delighted young and old for over half a century and could easily continue to enthral them for generations to come."